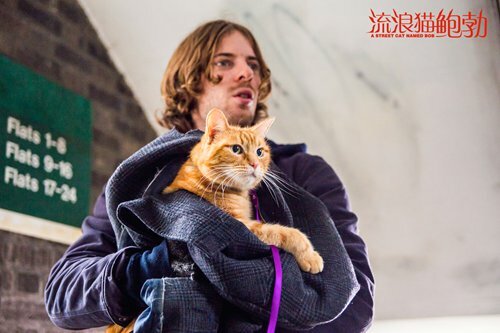 Based on a true story, Canadian director Roger Spottiswoode's movie A Street Cat Named Bob has been getting good initial reviews from Chinese moviegoers after holding a series of pre-screening events in major Chinese cities on Tuesday and Wednesday. Although the film was already released in the UK in November 2016, it has still captured the hearts of many Chinese film lovers with its touching story of a man who saves a stray cat. It currently holds an 8/10 on Chinese media review site Douban. The film tells the tale of Bob the Cat, an injured feline taken in by street musician James Bowen, who barely makes enough money to feed himself performing on the streets of London. As Bowen slowly nurses the cute cat back to health, it accompanies him, seemingly bringing him luck and romance. Several Chinese reviewers said they were pleasantly surprised to find that the cat in the film is actually played by the real-life stray cat found by Bowen. The movie is set to hit the big screens across the Chinese mainland on November 2.